New modern country style solid pine made small size shoe cabinet from FALUN range. 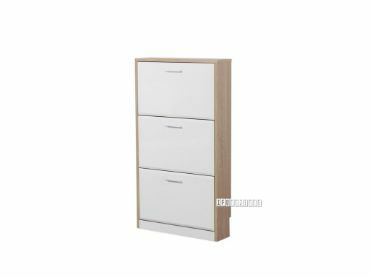 Solid acacia wood made shoe cabinet in medium size. A piece from our GOMERA Acacia Two Tone Cottage Country Style living and dining series. It characters thick acacia solid wood top and painted white semi solid acacia body structure, clean straight lines and antique look brown basalt handles. Alaska is a classical style hat and cloth stand. Our ANTON range covers dining and living rooms.ANTON has sizeable, whitewashed, solid acacia wood legs and frames, with matt white tops. The APPLEBY clothes rack comes in either white or black painted timber, it has A shaped ends with a natural timber rail on which to hang your clothes.